The Russell Lions Club presents: the RCMP Musical Ride! Yes! The rumours are true! 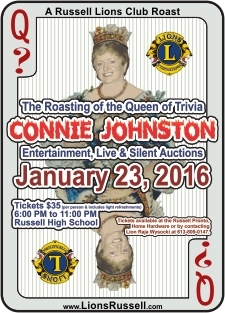 The Russell Lions Club is to be bringing the Royal Canadian Mounted Police Musical Ride back to Russell! A Canadian tradition since 1876, a troop of 32 scarlet coated “Mounties” on majestic black horses present a 30 minute show of intricate figures and cavalry drills choreographed to music. Take advantage of this truly Canadian experience and see one of our national treasures perform live at the Russell Fair Grounds (1076 Concession Street, Russell, Ontario) on June 1st, 2018. The excitement starts at 5:30 p.m.! Re-Live the RCMP Musical Ride! Tickets are $10 for adults, $5 for youth (between 5 and 13 years of age) and FREE for children under 5! ALSO PERFORMING: The Capital Cowgirls Drill Team! The Capital Cowgirls Drill Team is Ottawa and area's local equestrian drill team. Established in 2017, this team of ladies will warm up the crowd with their high energy and their exciting routines and maneuvers. The Capital Cowgirls are coached by Jen Byvelds from Nation Valley Ranch, assistant coach Melissa Leduc from 6L acres and is based out of Circle J Ranch in Metcalfe. We will be having a colouring contest! What can be won? We have made arrangements for a select few children to have an in-person meet and greet with one of the RCMP riders and their horse after the show. Get your colouring sheet at one of the outlets where tickets are sold! You can also download it by clicking on the thumbnail graphic to your right. 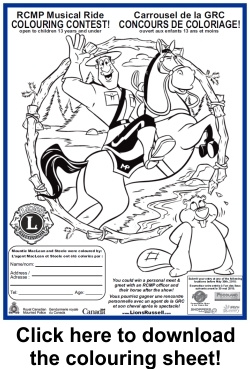 Pick up your colouring sheet when you pick up your tickets!